Use your data to improve and test customer experiences. Send personalized email and push notifications that retain customers. Manage emails, push notifications and custom interactions in one place. Get our latest blog posts, news and tips straight to your inbox. We've sent you an email to confirm your subscription. 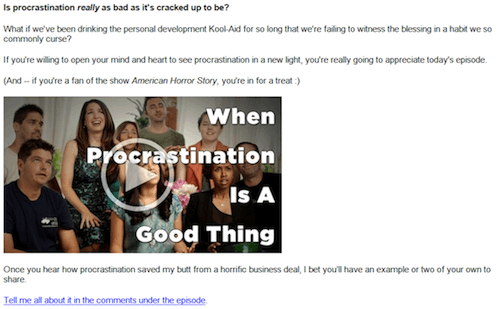 At this point, you’re much smarter about how videos affect your email marketing, right? You know it’s a great way to set yourself apart and get ahead of the competition. You know it gives you roughly 280 perfect ROI, which is an added bonus. And you know if all else fails, you can default to animated GIFs. But now you’re stuck with one question in your head: What do I do next? It’s a legitimate question. After all, how in the world are you supposed to get started when there’s so much involved in creating videos? You have to come up with a concept, write a script, find acting or voice talent, hire a videographer or buy your own equipment, shoot the scenes, edit the raw footage, add (legal) music/images, etc. And that doesn’t even cover how you’re supposed to even deliver the video to your email subscribers. If you’re overwhelmed already, never fear. This post will cover (nearly) everything you need to start making videos and including them in your emails. In reality, having access to the technology for making videos means half your battle is fought; now it’s just the creation and delivery you need to worry about. Once you know more about the basics of each, you’ll find video production far less daunting than you imagined. So are you ready to give some va-va-voom to your emails with video? Let’s get started. While we’ve done our best in this post to include all the necessary steps to getting videos in your email marketing, we simply couldn’t cover each area in-depth. For instance, video production itself is an entire industry and there are varying opinions and systems for how to get things done. This is a beginner’s guide to video and email marketing, and it’s more than enough to hook your audience and get you started on the right path. If you want more in-depth answers, you can check out magazines like Videomaker and HDVideoPro; subscribe to blogs like ReelSEO, Vidyard, and Video Brewery; or take courses from CreatorUp! or Vidpow. We also want to warn you to avoid going crazy with embedding videos in your email. Sometimes, videos aren’t meant to be shared exclusively within your emails. For example, if you have a landing page video, you can’t just include the video in email without also placing it on your landing page. It seems obvious, but these types of videos won’t perform as well if you only include them in email. But in general, what we’re talking about in this post has to do with videos you make specifically for your audience to view within email, like a “thank you” video or a quick “how-to” video about your product. So just make sure you decide on the purpose and goal of your videos before you include them in emails where they may not help you reach those results. Capiche? Awesome. Now, let’s get to the good stuff. That’s okay – not a lot of technical stuff is needed at this point. What you really need is a basic understanding of how to produce a quality video using the technical items you have. Know what makes your video look good. An average Internet user expects certain levels of technical quality in a professional business video. They immediately recognize video created in less than 1080p (HD quality); they also know when your audio sounds like you recorded during a hurricane. They really don’t like it when your face is light on one side and dark on the other. Oh, and shaky cameras are a no-no (for heaven’s sake, use a tripod when you film!). As long as you don’t make a video that looks like your 5-year-old accidentally recorded himself on your iPad, you’re a step ahead of many businesses. Find equipment. Remember when we mentioned there’s lots of tech available today to help you make videos? We weren’t joking. Video isn’t just for Hollywood anymore; now anyone can make great content on a budget.Use the equipment you can afford that gets good reviews. For example, a Blue Yeti microphone is a popular, professional-level product for only $150. Most iPhones have HD cameras which will be just fine for a simpler script, and software like Screencast works when you need to record your screen. If you have the budget, you can hire a production company to film your video, or pay an animation service like Animoto to create an animated video from your script. Pay attention to the script’s delivery. You could have written the most compelling, amazing story about your business, but your audience never notices because your acting “talent” makes the entire production sound like a corporate training video.Make sure whoever does the voice-over for your script has a strong voice, clear diction, and energy in every word. If you’re using on-camera acting talent – whether that’s yourself, someone in your company, or an outside hire – that person must be lively and interesting while not distracting from the content of the script with superfluous hand gestures or an unpowdered, shiny face. Keep it as short as possible. Research shows that audiences expect most online videos from businesses to be around a minute long. Technically, they prefer watching content only 30 seconds long or less. This means you need to save your detailed descriptions and ramblings for landing pages and site copy … the video is a quick overview hook only.Don’t stress, though, if you’re not sure you can keep your video to a minute or less. Sacrificing your message for length isn’t a good idea, because you’ll put false ideas about your business into audience’s minds. Again, take the Dollar Shave Club video as an example; while longer than usual at a minute and 30 seconds, it still managed to hold the attention of millions of people around the world. Include a call-to-action. Forgetting this will render your video efforts useless. The goal of your video wasn’t to just be a fictional piece, right? You wanted your audience to do something when they were done watching? Then include a call-to-action.Think of one thing you want your audience to do, and either have your acting talent state that audibly, or include on-text screen at the very end of the video. If you’re hosting the video on an external site (more on that in a bit), make sure you include any relevant links in the description, annotations, or overlays so people are directed to the right location on your site. Take a moment to pat yourself on the back. You’ve just created a video! Figure out hosting. This doesn’t have to be as technical as it sounds. Basically, when you create a video you need to store that file somewhere online so your email subscribers have access to it. If you’re on a limited budget, YouTube and Vimeo have fairly robust free accounts available. However, if you’re thinking you’ll be making more videos in the future, consider investing in more server space to host your own videos or go with a professional video-hosting service like Wistia.Even if you don’t host your videos on free sites, make sure to place them on (at the very least) YouTube. Putting it on this ever-growing site and optimizing for SEO means you have a high chance of people finding it and taking action. (See slides below.) This is especially true if your video is the kind of visual content people are looking for. Using video keyword research and normal keyword research to find what your audience is interested in means you’re far more likely to get traffic back to your site (just make sure you add that call-to-action!). Create a fall-back image. Even though more than 50 percent of email service providers now support videos through HTML5, you have a large portion of your audience to worry about. Bottom line: always include a fall-back image.And not just any image. You need a compelling one. This means no boring logos, no images without text, and no images that aren’t relevant to the video. Create your fall-back image with the clearly-emblazoned video title with a “play” icon over top. Insert the image into your email body, and then link to your video externally so people understand it’s still a video they can view. Need a good example? Follow in the footsteps of business and lifestyle goddess Marie Forleo, who markets her MarieTV episodes in email. Get to the point … after a tease. One of the biggest mistakes you can make when adding video to your emails is plopping it right in the beginning of the communication and assuming your reader will get what it is. You need to give it some context and quick explanation before you embed, otherwise, you’re just going to confuse people right off the bat.Your introduction to the video doesn’t have to be long. In fact, when I created my free videos for my subscribers, I only included 2-3 paragraphs in each email before I included the video. But that doesn’t mean you can’t write 300 words or more before your video if you wish. The key is to test what your customers respond best to, and keep repeating that system (doesn’t it always come down to testing?). Optimize for mobile. For the love of all that is good and holy, always optimize for mobile. Stats reveal email is opened on mobile an average of 48 percent of the time, and it’s not likely that percentage will be going down in the near future. You need to make sure whatever video you include in your email marketing campaigns looks good on mobile screens.Start by referencing your stats on the types of devices your customers are using to read your emails. Make a list of all the mobile devices that show up, and test your emails on each device. It can be a joint venture among your colleagues, or you can assign the task to one person; simply adjust what needs fixing. Overall, the process shouldn’t take too long, and you don’t want to be part of the 32 percent of email marketers without a mobile strategy when 64 percent of decision-makers read email on mobile devices! You got this far, which means you learned more than many companies have about videos for email. Now you’re that much smarter – treat yourself to a latte! Going through all these steps one at a time with a focus on quality execution will ensure your videos are created with at least an intermediate level of production quality. It’ll also guarantee they get delivered to your audience properly. There may still be hangups here and there – rendering, for example, can be a challenge – but overall you should be set to start using video in your email marketing. Just remember, creating videos can be big undertaking, but it can also be very rewarding. Have any questions? Let us know in the comments. By subscribing, you consent to let Vero send you messages regarding marketing and product. You can learn more in our Privacy Notice, and you can opt out or change your consent at any time. Create a free account, import your data and see how Vero can help your team.